Peaches McGee: Paper Box or Origami? What began as a journey of replicating Martha Stewart projects turned into a passion for creating original works of "art." Another project, another a) not so great finished product, b) even worse set of directions! Since I was busy with Peaches McGee's first birthday, I thought I would tackle an easy project: paper boxes. The directions were pretty straightforward (and yes I read through all of them before starting the project), and the picture made it look like I'd have a useful set of cute boxes when I was done. I started with the first box (there are seven total) which is the smallest. Probably not the smartest thing I've ever done, but the picture in the book (here's a link to it which I can't post due to copyright issues, blah blah blah), didn't appear to be too small. Maybe one in which you could put paperclips or something in it. Try one earring, and a stud earring at that. The thing is frickin' tiny. And the measurements DO NOT WORK. The lid would not fit onto the box no matter what I did. For a tiny box like that, I went through an entire sheet of 12" x 12" scrapbook paper. However, I outsmarted that woman. I went online and searched for origami box instructions with a lid and found AWESOME step-by-step instructions (check them out here). I used these instructions for the next three sizes of boxes and they turned out great! I then decided to try the instructions for a bigger-sized box since I wouldn't have to use tweezers to fold the paper or a magnifying glass to see what I was doing. Still lame. While I was able to get the measurements to work, it wasn't sturdy and the lid would not stay on the box. So here are the pictures which totally glorify the project because of the cool "Hipstamatic" app for the iPhone. I'm just tired of looking at all the other craft blogs and seeing these GORGEOUS photos of their projects and mine looks totally heinous in comparison. Now, can you tell which one used Martha's directions and which used the origami ones? p.s. It is very annoying to learn that most (if not every) project in the book that I purchased is online. Thanks Martha. I really love spending $35 (okay, I got it through Amazon for less than that, but it's the price on the back of the book) on something that I can get for free!!! p.p.s. 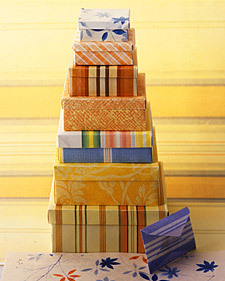 I also am a little irritated that in the book she calls them "Paper Boxes," but on MarthaStewart.com, they're "Origami Nesting Boxes." According to Wikipedia (which is never wrong) ;), "The goal of this art (Origami) is to transform a flat sheet of material into a finished sculpture through folding and sculpting techniques, and as such the use of cuts or glue are not considered to be origami." YOU CALL FOR GLUE MARTHA, so it is NOT origami. I am impressed with the boxes. You have much more patience than I do. I would have stopped after the first one and gotten rid of the evidence. I thought about it Aunt Penny... trust me, I thought about it. I got the stay-at-home mommy blues and realized that I had a creative bone. After only 2 years, I returned to work. This is my journey that vacillates between flexing my creative muscle and running a non-profit in the commercial equipment finance world. I was a non-creative, very analytically professional business woman who decided to stay home after having my little girl (hereinafter called 'Peaches McGee'). I realized that there was a creative side to me that I needed to explore and decided to pull a "Julie and Julia"-type experiment and take all of Martha Stewart's projects and recreate them. What I found was that I had my own thoughts, ideas and creativeness. This is my blog that explores that.